The early Song dynasty (960–1278) was a time of immense intellectual fervor, as China rulers, after over a century of internecine warfare, embarked on a new course that promoted wen (literary or cultural arts) over wu (martial prowess). With the new literary based agenda came a discussion of how to constitute Song’s wen agenda, how to define wen values, what kinds of literature should be included and what excluded, and so on. 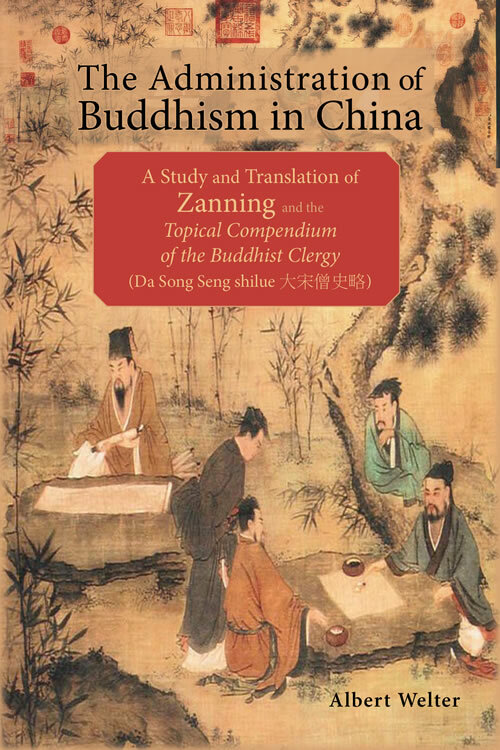 Zanning (919–1001) was the leading Buddhist literatus at the Song court and his Topical Compendium of the Buddhist Clergy represents a major contribution to this debate, the understanding of which would be deficient without it. The new Song consensus which he helped forge became foundational for the future of China and formed the model for culture and civilization throughout East Asia. The Topical Compendium of the Buddhist Clergy is a primary source of our knowledge of Chinese Buddhist institutional history. It details practices and policies regarding the administration of Buddhism that are otherwise difficult to access, and is the major work of its kind in the Chinese context. It establishes principles for the administration of Buddhism in China, many of which were customarily followed. Zanning’s work was compiled at the request of emperor Taizong (r. 976–997) for the purpose of educating the emperor and scholar-bureaucrats on matters pertaining to Buddhism, and thus serves the primary purpose of a guide book or primer on things Buddhist that Song administrators may need to know. The relationship between religion and the state is a topic of major concern in the history of religions. While books, articles, and essays on this topic are common for other regions of the world, especially the West and increasingly for Islamic regions, there are few works discussing the dynamics of religion/state relations in China. Studies are beginning to appear that discuss the dynamics of religion/state relations in modern China, and while many studies of pre-modern Chinese religion touch on this topic, there is no study in English that addresses this topic head on. The relationship between religion and the state in China is a perennial problem that shows no sign of losing its significance in contemporary international affairs, and studies of the history of this relationship with a focus on Buddhism, the most articulate religious force in China during the past couple of millennia, cannot but have a real value to scholars and students. Zanning’s Topical Compendium of the Buddhist Clergy engages the issue of the Buddhist presence in China directly, arguing for the clear and consistent contributions of Buddhism to Chinese culture and society in an unambiguous way. While ceding claims to independence, Zanning offers that Buddhism is an integral component of China’s culture, not an alien tradition anathema to Chinese values, but an important contributing factor to them. While other works argue in favor of Buddhism in the Chinese context in doctrinal and intellectual terms, only the Topical Compendium of the Buddhist Clergy asserts the necessity of Buddhist institutions and customs as assets in administrative affairs. The Administration of Buddhism in China: A Study and Translation of Zanning and the Topical Compendium of the Buddhist Clergy is an important book for Asian studies, Buddhist studies, and history collections.